Destiny is home not only to many memorable characters, but also to a number of adorable kitties. There's Trouble, the kitten Mick brought home to Jenny in One Reckless Summer, Shakespeare, the demanding stray that finds a home with Mike and Rachel in Sugar Creek, and Mr. Knightley, Amy's pampered pussycat. And each subsequent Destiny book will bring a new cat into the lives of a couple about to find love. 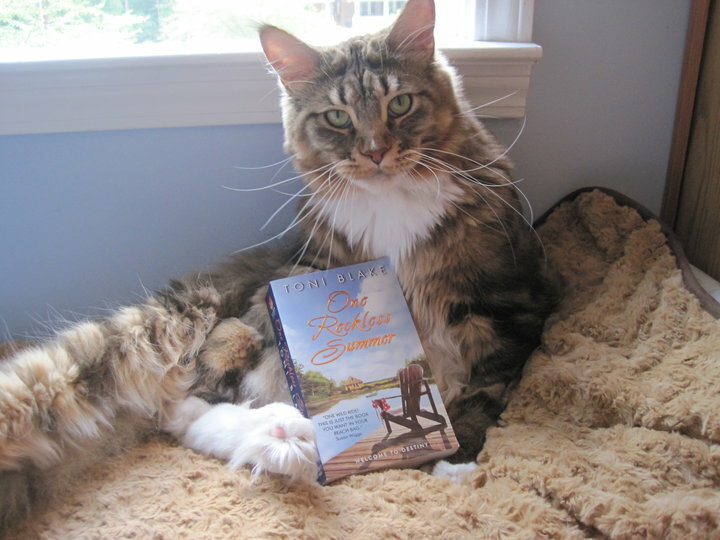 To celebrate the perfect combination of cats and the Destiny series, Toni hosted the Destiny Cat Idol competition, in which readers sent photos of cats posed with Destiny books to compete for cat stardom - the chance to have their cat mentioned in an upcoming Destiny book. Milo, the grand prize winner, is pictured above. We were thrilled by the response, and we hope you'll enjoy seeing the full gallery of fabulous entries.